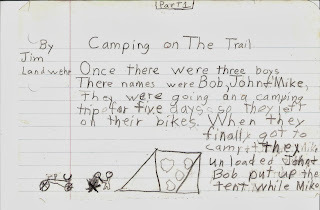 I've been actively writing since about the fourth grade. 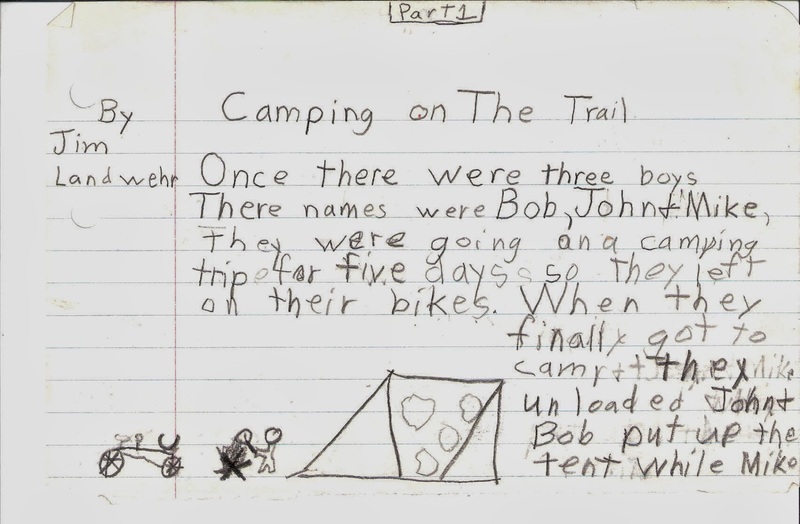 Of course, it has been an on again/off again affair over my lifetime, but if I had to pin down when I first realized my love for writing, it would have to be in fourth grade. It was then that I wrote some stories that were not even required for class. I did them just because I enjoyed creating them. Each of the stories were written on 1/2 sheets of paper which were then cut in 2 and put together like a short book. I still have the stories, Mom saved them over the years, and there are some common themes to them, namely disaster, some sort of resolution to the disaster and a moral to the story. I remember a nun teacher of mine asked if she could put one or more of the stories in a special box for the class and I really wasn't keen on the idea. (Author's rights at a young age, I guess.) She got the drift and backed off, but it was really kind of cool to be acknowledged for something I just thought was fun. Through high school I didn't really do much in the way of writing, but during my college years I took it a little more seriously. I never minded long papers and some of my English classes were my favorite. One thing I did do during my college years was started writing letters. I wrote to my brother, my friend in Ireland and a host of others. I knew the thrill of getting something in the mail and I knew that it took sending a letter to get one. Shortly after college, I moved to Wisconsin and the letter writing took on a much bigger role. I wrote home, I wrote to my brother in NY, and eventually I started writing to Donna who would later become my wife. It was during this time that I started hearing from people fairly consistently who said "I love your letters" or "Your letters make me laugh." This kind of feedback meant more to me than anything. Although I was not tapping my talent in a "productive" way through publishing or formalized classwork, I was still putting pen to paper and maybe becoming a better writer along the way. For the next, oh, twenty years or so, I floundered around not taking it seriously or knowing how to go about doing so. I gave some thought to getting a Masters degree in Journalism for a bit, but after talking to a writer who used to work for the Waukesha Freeman who asked "Do you like long hours and little pay?" I decided that might not be the career path for me. I'm not sure I would like the parameters of writing news and expose' articles anyway. My preference is for humor and memoir. Then in 2006, I finally took action and enrolled in a short course offered through the City of Waukesha titled "Writing from your life." It sounded like exactly what I was looking for. Non-credit, non threatening, and memoir based. The instructor Shannon Jackson Arnold was nothing short of inspiring and encouraging. One of the goals of the class was to have a 10 page paper written by the end of the session. I did mine on stories from the Boundary Waters and as it later turned out, it was the flash point for my work on my BWCA Manuscript. After the class finished I floundered for a couple more years until I finally emailed Shannon and asked her what I should do. She was forthright with getting me to set some goals and stick to them. I started by checking out a class at AllWriters' Workplace and Workshop. I audited a class before I signed up and realized within the first half hour that it was exactly where I needed to be. Under the direction and instruction of Kathie Giorgio (and, later, Michael Giorgio,) I discovered I was among other mere mortal writers who were struggling with the same things I was. I continued in that Workshop for three years and then took a couple of the book writing classes through the same studio. I began getting my poetry published within a year of enrolling, and within a year and a half I had my first paying nonfiction piece published. My goal all along was to get published, getting paid for it at times has been a bonus. My writing has given me great joy over the years. (Don't get me wrong, it has given me a fair amount of angst as well.) In some ways I think it even gave me my wife and, as a result my life. Donna has always said that my writing won her heart first. (Before my good looks. LOL). I'm glad I finally found the road I should be on. I'm glad I finally took the steps I needed to take. Now, I'm writing for my life.